Agile Tips: Back to the basics: What made this Agile Inception especial? Back to the basics: What made this Agile Inception especial? The following two pictures depict the latest Inception I participated at. A little bit of history: For the past two years I have participated directly in 3 Inceptions, and indirectly in 5 inceptions. By directly, I mean, I was sitting in the war room for most of the Inception sessions. And by indirectly, I mean, I was participating on the Inception sessions over video from a Nearshore location (onshore is San Francisoc, USA, nearshore is Porto Alegre, Brazil). 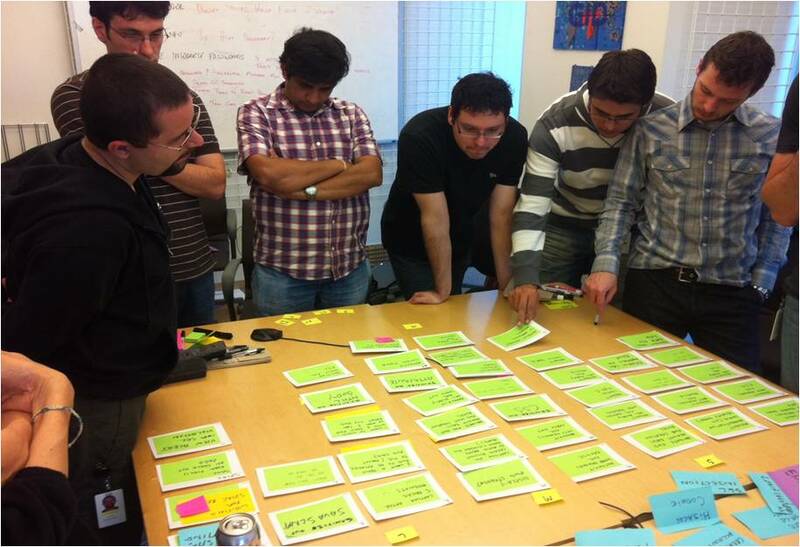 I attribute the success of the last Agile Inception to 3 things: collocation, war room, and colorful post-it. Don’t under estimate the value of a face to face interaction. I am currently in Brazil and I am used to having effective meetings over video and phone with USA. I know that technology can bring people closer together, and, perhaps, we can work together without sitting next to each other. However, the face to face during Inception will bring the team together in a way that it will be worth each penny spend for making the collocated Inception a reality. I compare it to dating and internet dating. Relationship development goes to another level when the whole team is at the same room. Think creatively on how to save on costs. In our case we were able to reduce the collocated period by having a pre-Inception period before the collocate Inception. Spikes, research, data gathering, codebase analysis were the sort of activities we did in the pre-Inception week. Keep a single room for the team during the intense Inception period: the war room! The room should fit all team comfortably. It must have a clean table and wall space. The room should also have a cabinet or a box with index cards, colorful post-its and pen. The war room makes the environment for collaborative sessions. It also avoids the waste of time of people moving from one room to another. Another important point is about carrying the information between rooms. You can either carry all hand-written notes (index cards, post-its, flip-charts, etc) and put them back in the wall and tables, or upload them on a digital format and carry it on your laptop. The former option is a waste of time. The later lessens people interaction. There is no replacement for writing on and tearing apart colorful post-it or index cards. Once the information goes to the computer, it will not get back to paper. People interaction reduces as there is nothing on the table to gather around. Do not bring a list of existing user stories to the Inception. I am sure there is a list somewhere (excel, Jira, or alike). Use it for reference, but don’t use it for driving the Inception sessions. Print a few copies and bring them to the war room. Let people consume it if required. Try not to read items from a list during a collaborative session. In fact, do not build a list while in a collaborative session. Group people around colorful post-its. Write and place post-its either on the table or at the wall.. Talk about them. Write a few more. Tear them apart. Make use of colors. Reorganize it. The collaboration from using such basic, low-fi technology— colorful post-its and pen—cannot be matched by any digital alternative (file sharing, projector, spreadsheets, etc). The picture below depicts a great example from my last Inception. Without a previous encoding, the team decided to use the colored small post-its for personas. User Stories (in green post-its) were placed on white index cards containing numbers and estimated (with notes on the back). The pictureCheap wow gold under depicts a excellent example from my last Inception. without obtaining a preceding encoding, the group made a decision makeBuy rs gold utilization of the coloured modest post-its for personas. Referred to as the second biggest capital of the planet, Beijing boasts of a booming economic climate and modern-type architecture Chinese Dress. But, one particular engaging characteristic of your city is its fusion of old and new with as they preserve their national heritage. Elena has her old disproportionate the exquisite magic skills d3 gold and steely will to fight, but the truth of her origin allows it all becomes diablo 3 gold a matter of course. Comparing with other MMORPG, Diablo 3 is one of the most succesfull games. At least, I like it best. It is easy to operate as I do not need to operate on four direction key to control the directions my profession plan to go. I just need to click the mouse to lead him, which is totally different from the World of Warcraft or the Guild Wars 2. Secondly, It is easy to level up and run the maps, which means it is easy to enjoy this game. The only one skill to play this game well is to learn something about the diablo 3 weapons. As the weapons play very important role in this game, which can get you abundant diablo 3 gold and chances to win the war. Owing a best d3 weapon is a thing that worth to be proud of. You won't want to miss it. Have fun! 5) Please ensure all the information you filled is correct.